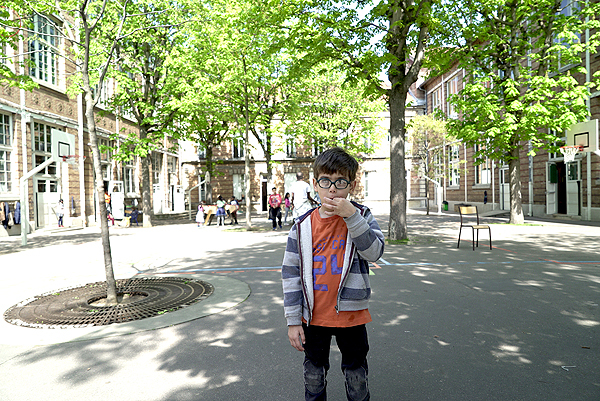 On June 21st2018, the Pierre Budin Elementary School, located in the heart of the Goutte d’Or in Paris’ 18th arrondissement, launched the sound piece “Train Your Bird to Talk” by David Brognon and Stéphanie Rollin. 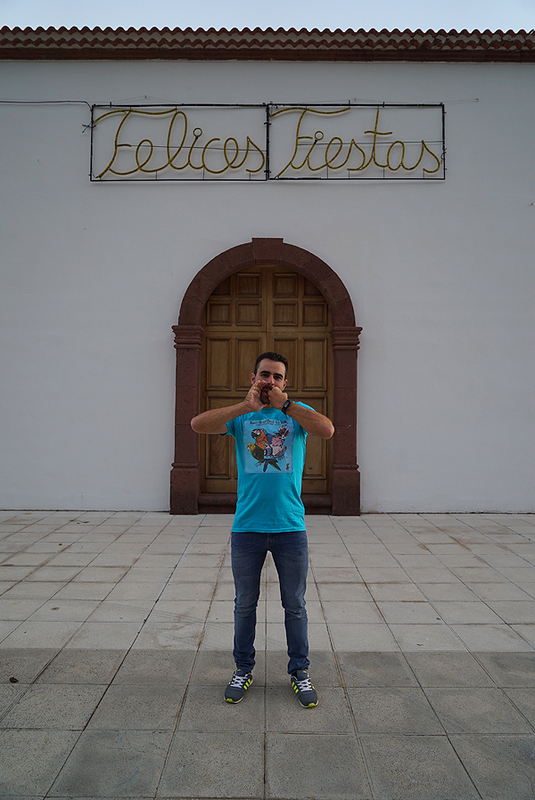 “Train Your Bird to Talk” is the new bell for the school, where the call to begin or end lessons will be chanted in Silbo, a whistled language used on the Canary Islands’ La Gomera. “Train Your Bird to Talk” is a permanent artwork pursuing the Budin School’s privileged relationship with contemporary art. Initiated by the Budin School’s director Pierre Perrin with the participation of the school’s teachers and pupils, the art commission was executed within the framework of the Fondation de France’s Nouveaux commanditaires procedure. The commission was also supported by the Mairie du 18ème, the Service d’Horlogerie de la Ville de Paris, the Ars Ultima Stein-Guillot endowment fund and the Untitlthen Gallery. The commission was implemented by Jérôme Poggi and Thomas Conchou, accredited mediators for the Fondation de France’s Nouveaux commanditaires procedure within the not-for-profit SOCIETIES structure. 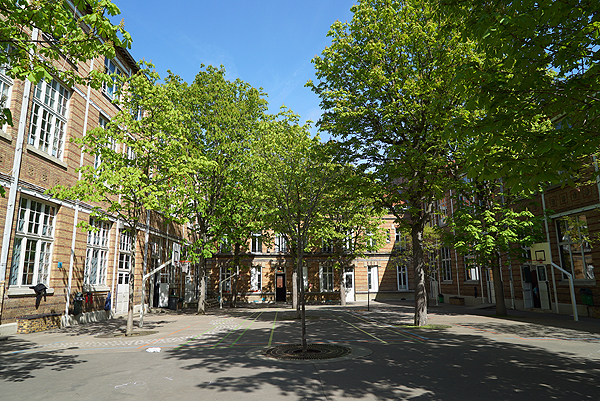 Located in the 18tharrondissement’s grassroots and multi-cultural Goutte d’Or neighbourhood, the Pierre Budin Elementary School is typical of the “Jules Ferry” model for elementary schools. Built in red brick and with the republican motto over the small entrance door, it is architecturally conceived as a protected space—but as a result, it is also a space that is isolated and closed on itself. Since he took office in 2010, the school’s director, Pierre Perrin, has opened the school to the world, inviting artists to take part in the life of the school. Taking advantage of the publication of a circular by the French Ministry of National Education which made it possible for elementary schools to welcome artists in residence, Pierre Perrin set up an ambitious residence program with Claude Lévêque, Chourouk Hriech, Malachi Farell, Bertrand Lamarche and Daniel Larrieux. 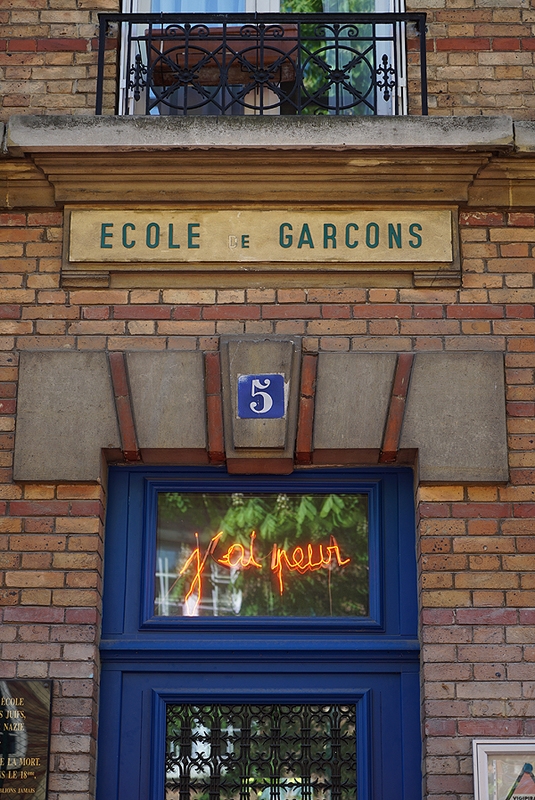 Responding to the artist Claude Lévêque’s neon installation at the school’s entrance—whose text, “J’ai peur” (I’m afraid), sparked many debates—the school’s director and teachers decided to commission an artwork marking, this time, the end of class as well as the cadence of school days. At the proposal of Jérôme Poggi, accredited mediator for the Fondation de France’s Nouveaux commanditaires procedure, the artists David Brognon and Stéphanie Rollin were commissioned to conceive an artwork. “We chose to replace the school’s strident bell with human whistles. 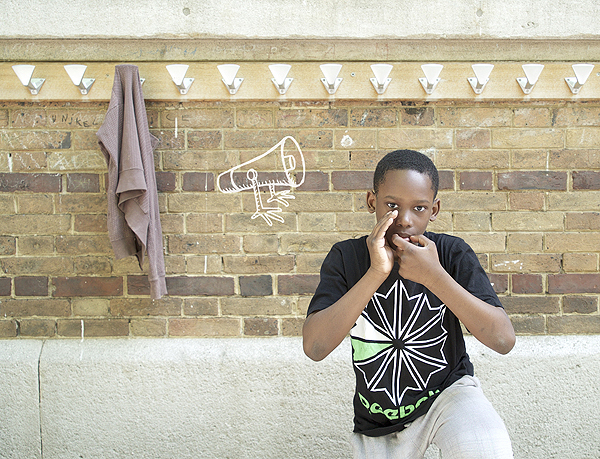 We asked the pupils what the beginning and end of class evoked for them. The pupils then transcribed their emotions into phrases, which resulted in “It’s play-time,” “Come and eat!” “Yippee it’s over” and “We’ve got work ahead” for instance. We translated these sentences and had them whistled in Silbo. 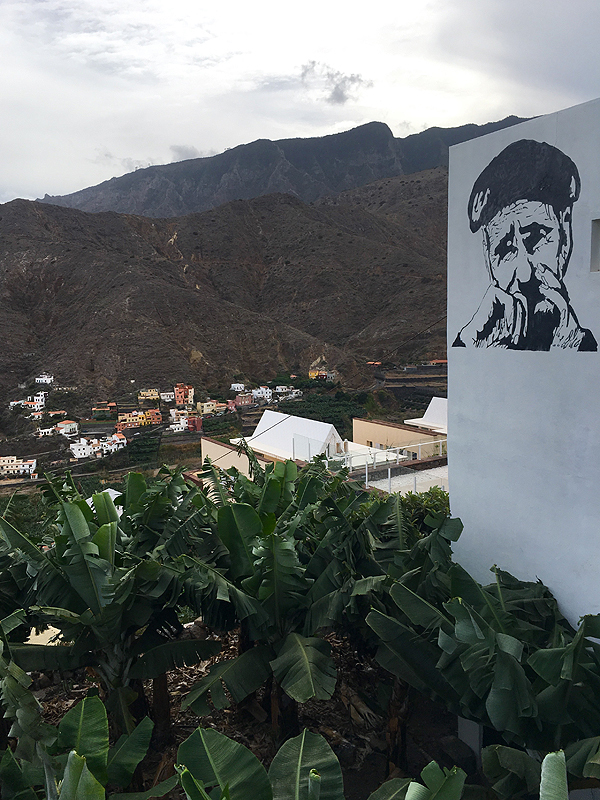 La Gomera in the Canary Islands archipelago has one of the last whistled languages in the world: the Silbo Gomero. Birds are omnipresent on La Gomera, as on each of the Canary Islands, where the famous domesticated canaries can be heard in cities as well as in forests. Silbo is a whistled language that merges with the language of the birds on the island and which has adapted in order to enable communication from valley to valley, facilitating survival in a very particular environment. The inhabitants have developed Silbo to such an extent that it has great technical complexity and aesthetic refinement. It has become a quasi-musical language, passed on from one generation on to the next. Today Silbo is recognized as Intangible Cultural Heritage by UNESCO. We composed 17 sentences, with pupils aged from 6 to 11 years old. Translated into Spanish, the sentences were whistled in Silbo by the Silbo professor Juan Manuel Chinea Garcia and then synchronised to replace the 17 daily bells giving rhythm to each school day,” explained David Brognon and Stéphanie Rollin. David Brognon and Stéphanie Rollin (born in 1978 and 1980 respectively) are recognized for their talent for absorbing strong contexts. On the occasion of their residency in a fix room in Luxembourg, their stay in Jerusalem to capture the Holy City or their recent intervention in Charleroi when the Caterpillar plan was shut down, Brognon and Rollin have produced sound and universal responses, always serving the human element. Brognon and Rollin thus go with brio from a strong gesture (with time-based artworks such as the tracing of the Île de Gorée) to delicate gestures as with the sound piece for the Budin School. Brognon and Rollin will be invited to the next Melle Biennale from June 30thto September 23rd. They will also have a solo show at the Untilthen Gallery in Paris starting September 8th. The Nouveaux commanditaires procedure. Invented by the artist François Hers in 1991 and supported since its origin by the Fondation de France, the Nouveaux commanditaires procedure democratizes the principle of the art commission which—while it has been a cornerstone in the genesis of numberless artworks in history—was until the end of the 20thcentury the privilege of those with financial, religious or political power. Today the Nouveaux commanditaires procedure makes it possible for any citizen, or group of citizens, who expresses and justifies the need for it, to take responsibility for the commissioning of an artwork in the general interest. Over four hundred and five projects have been or are being executed in France and abroad. SOCIETIES is a non-governmental not-for-profit cooperative structure founded by Jérôme Poggi in 2004 and coordinated by the curator Thomas Conchou. SOCIETIES’ aim is to bring together all members of society who wish to interact on the art scene by commissioning an artwork. SOCIETES seeks to encourage not only new audiences but new players to take part in today’s arts economy. SOCIETIES implements in particular the Nouveaux commanditaires procedure, initiated and supported by the Fondation de France in Paris and Île-de-France. With the participation of the Silbo professor Juan Manuel Chinea Garcia for a walk-through and a series of workshops with the School’s pupils. “Train Your Bird to Talk” was executed within the framework of the Fondation de France’s Nouveaux commanditaires procedure and with the support of the Mairie du 18ème; the Service d’Horlogerie de la Ville de Paris; the Ars Ultima Stein-Guillot endowment fund; and the Untitlthen Gallery.